It’s hard to believe it’s already September. I arrived in Hong Kong ten weeks ago, to hot, humid, sticky weather. It was hard to acclimatise, but I kept thinking to myself ‘It’s ok, in a few months it’ll cool down a bit.’ I repeated this so myself so many times that on 1st September I woke up expecting Autumn to have miraculously arrived and the temperature to have significantly dropped. Alas, it’s still just as hot as ever! Intriguingly though, the locals seem to believe summer is over: next Monday is the mid-Autumn festival here, suggesting the season is already well underway; one of my local friends asked me this week if I could already “feel Autumn in the air” (…no); and H&M is already well-stocked with winter clothes. So I am taking their lead and tucking into a lot of hearty and Autumnal dishes. 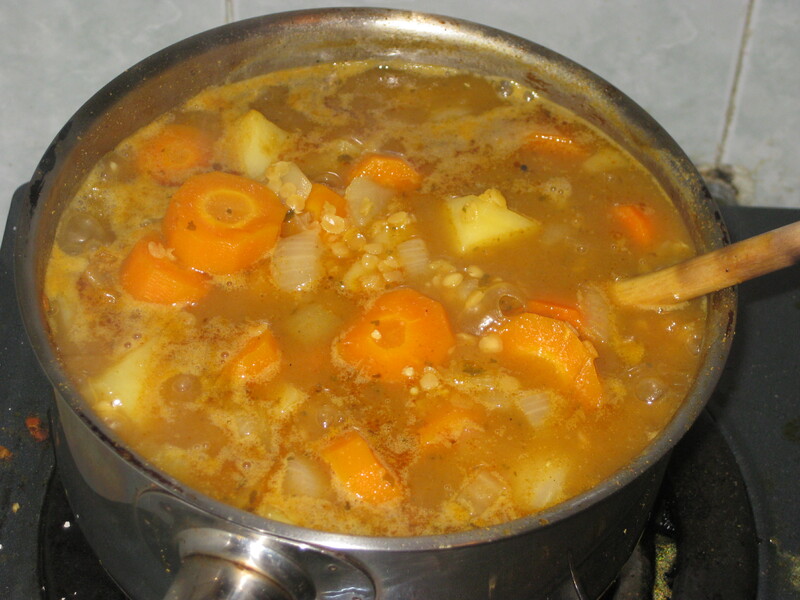 As a vegetarian I just love stews and casseroles with different vegetables, and this one below is one of my favourites, both healthy and substantial. 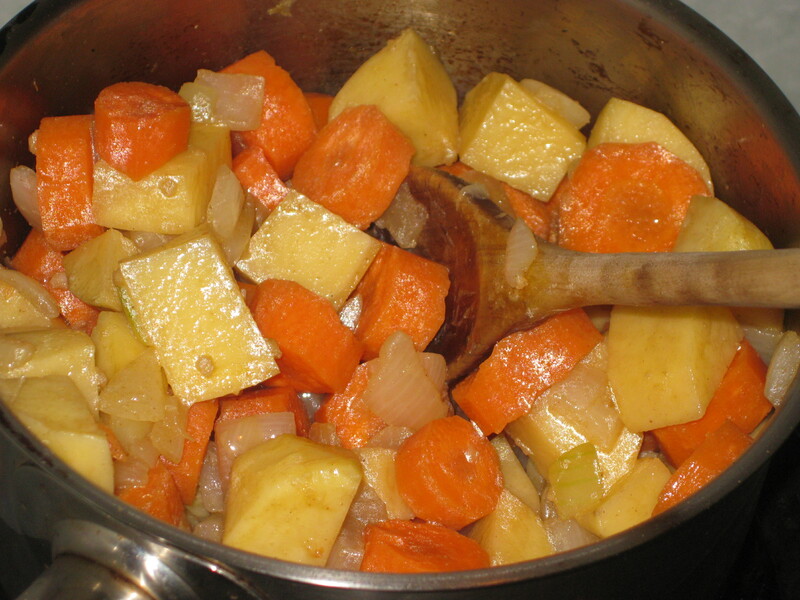 The original (from the BBC Good Food) uses a mixture of parsnips and carrots, and only normal potatoes. As much as I love parsnips, I usually can’t find them abroad (or they’re ridiculously expensive), so I stick to carrots, and use predominantly sweet potatoes. Even when it’s as stupidly hot as in Hong Kong, I always enjoy this dinner. 1. Heat the oil in a huge pan and cook the onion and garlic over a medium heat for 4 minutes. If you’re using ground coriander, add it with the onion and garlic. Add the potatoes and carrots and cook on a slightly higher heat for about 5 minutes. Add the curry paste and stir well to coat all the vegetables. 3. Stir in the coriander leaves, season and serve with a nice bit of bread, and some soy/plain yoghurt, if you like. 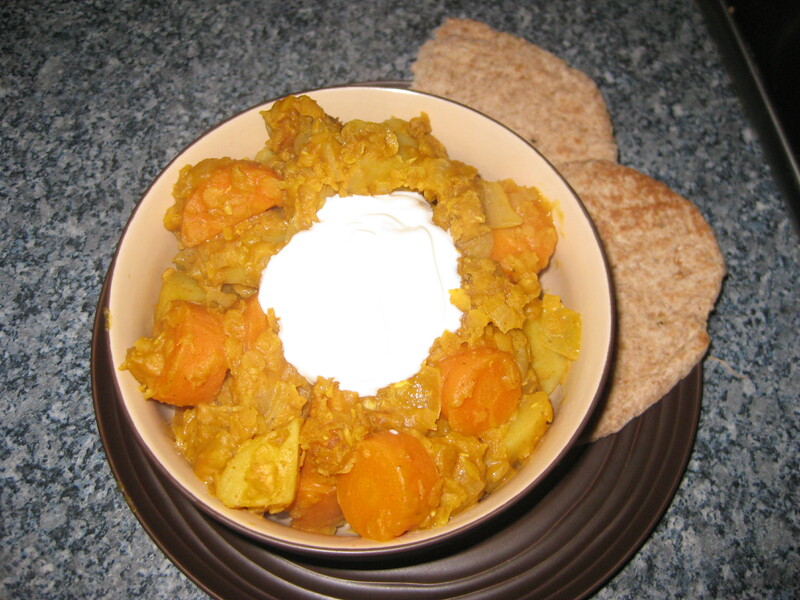 This entry was posted in Vegan Recipes and tagged carrot, casserole, lentil, potato, spicy. Bookmark the permalink.